the random outpourings of my mind! Dress how you damn well want! Inspired by Retro Chick ‘s latest post (www.retrochick.co.uk) I was set to thinking about how people see others, in respect to their dress. I like to think of myself as pretty non judgmental when it comes to how people look but I am sure I make subconscious judgments about people based on their clothes. In my world view going outside of your own garden in your pyjamas is unacceptable. I have been known to dash to the bin in my PJs when I think the binmen might turn up while I’m dressing, but going to the shops/school run etc is just Not On. It only takes five minutes to wash your face, yank a brush through your hair and pull on jeans or joggers and a top. Where did the going out in PJs come from? It strikes me as pure laziness and not having respect for yourself. (To any of my friends who do this, I still love you and all your flaws :-*) I sometimes see people in the street and long to give them a makeover – nothing radical – simply replacing ill fitting clothes with well fitting and in colours that suit them. I always used to dress to suit my own taste and style, yes there were a few disasters but that’s part of growing up and discovering who you are. Then medication caused me to pile on weight and life caused me to lose myself. I fell into the ill-fitting jeans/t shirt/ponytail all the time trap which is fine if that is you but it isn’t me. Yanking myself up by the bootstraps I cut my waist length hair into a layered bob, rediscovered my eyeliner, lost 3st and found my own sense of style once more. I dress to please myself which means dresses of all lengths, but with a leaning towards tea dresses and circle dresses for everyday, classic jersey dresses (mostly Boden ebay bargains) or skater dresses for work and either cigarette, Capri or wide legged trousers. My jeans are slim fitting, because that’s how I like them. I do have a couple of pairs of boot cut jeans and cords but I don’t wear them very often. Going out I will wear “wiggle” or pencil dresses but I haven’t quite worked up the courage to wear them during the day – other than pencil skirts. Maybe getting some sucky-in underwear will make me braver! People often say I look dressed up when I think I’m just dressed normally. Today is a “slobbing clothes” kind of day and I’m in a pair of plum coloured, boot cut cords, a somewhat faded black, long sleeved tunic top and my favourite cardigan which is actually knitted from a 1950’s bedjacket pattern. That kind of outfit may be dressed up to somebody else. I think what I’m trying to say that everybody has the right to wear what they damn well want but it is my opinion that everybody should respect themselves enough to wear well fitting clothes that suit them, whatever their style…….and leave the pyjamas at home! I have a huge problem buying knee high boots. Although I am below the average size of a British woman (size 16) I have very fat calves. 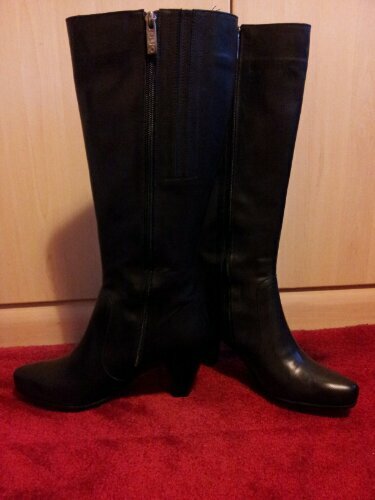 I rarely find knee boots that fit in ordinary shoe shops, they simply will not zip up. Pull on ones are a bit better but they’re rather thin on the ground. 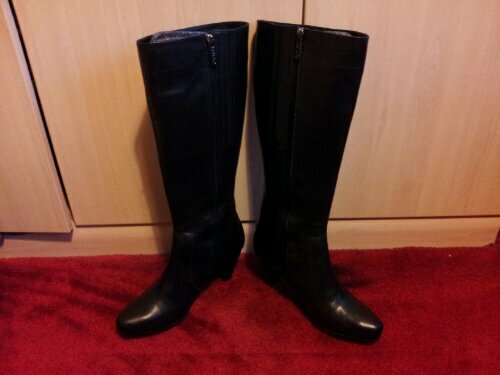 Knee high boots from shops for the fuller figure, such as Evans are too big and baggy around the calves. So when I got the small financial benefits of working extra hours I decided to look around for a pair of boots that fit. I ended up at Duo (www.duoboots.com if the link doesn’t work)who sell footwear based on measurements rather than standard sizes. Shoes and ankle boots are based on the width of your foot, while knee high boots come in standard shoe sizes but they have up to 21 calf widths. I gaily measured my calves, filled in the form and my bank account was distinctly poorer for it. The first lot I received were too small because I’d measured my calves too low down, so I watched the measuring guide video clip and measured again. Precisely one week after taking the unsuitable pair to the courier collection point my replacement pair arrived. They are beautifully packaged, in a very strong box, much stronger than the usual shoeboxes. Each boot was stuffed both foot and calf to keep them in shape and they were lovingly wrapped in tissue with a leaflet with instructions on care. 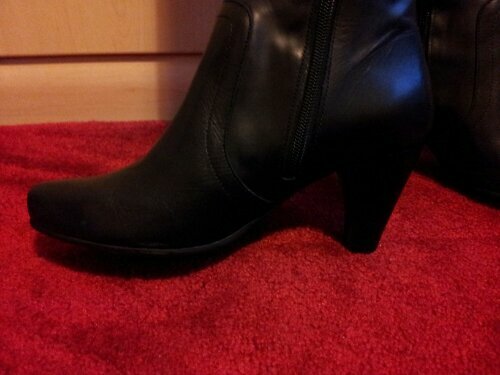 The outer boot is lovely glossy black leather, really soft and the quality feels wonderful. The linings are also leather, buttery soft and a pale gold. They feel wonderful on my bare legs, they don’t rub at all, although I am more likely to be wearing them with tights or leggings. Some of the reviews complained that the ankles were too small but I didn’t find it so. Either my ankles are slimmer than I thought they were or those reviewers had ankles that are much larger than mine. The fit on my feet was very good too, my feet tend towards a narrower fit but the cut of the boot feet is on the narrow side too so no problems there. As all who know me are aware, I am addicted to heels, although nothing too high. These are described as ‘mid heel’ and are a comfortable height for walking in. They give me enough lift that my stunted growth isn’t as noticeable and I merely look dainty and petite……at least that is my intention and please don’t disabuse me of that!!! 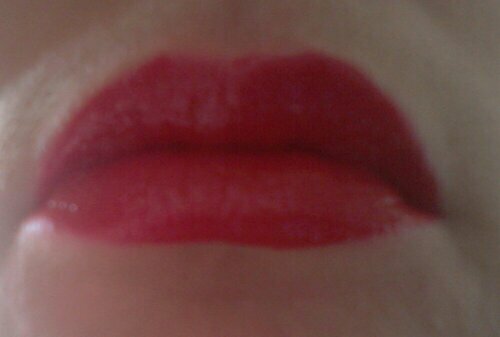 It gives wonderfully rich, smooth coverage on the lips. 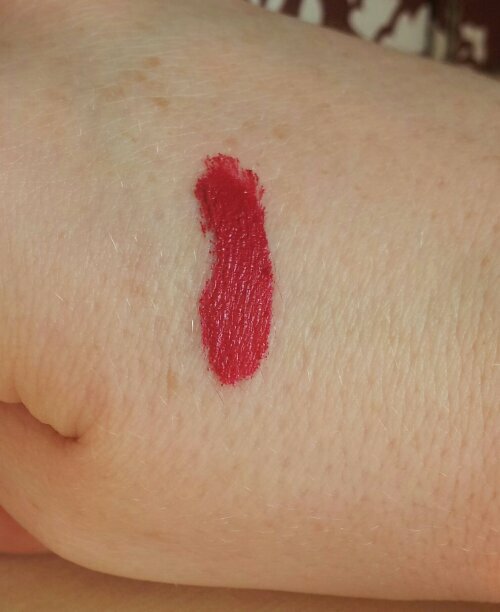 Only one coat was needed for bold colour and it is lovely and soft and doesn’t dry the lips out as other long lasting lip colours can do. I can easily wear it alone and not feel dry. 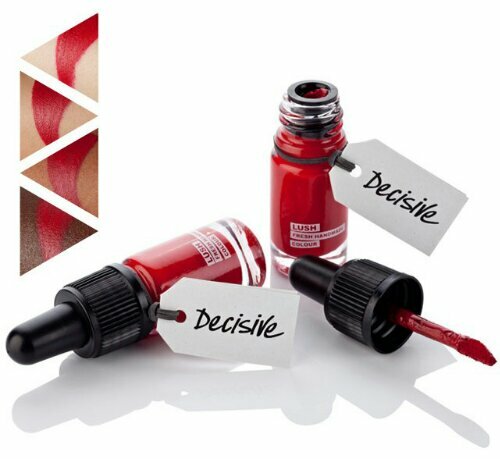 It is still on my lips after lunch and several cups of tea, although the softness had dried a bit but it returned after a swift application of clear gloss. 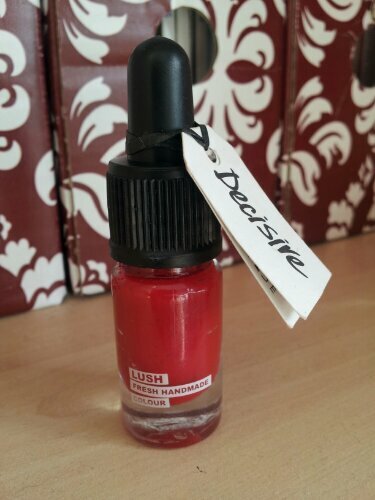 The colour isn’t as red, it has toned down to a much pinkier shade which is not unpleasant and I suspect it will finally end up as a stain – not something I would complain about! 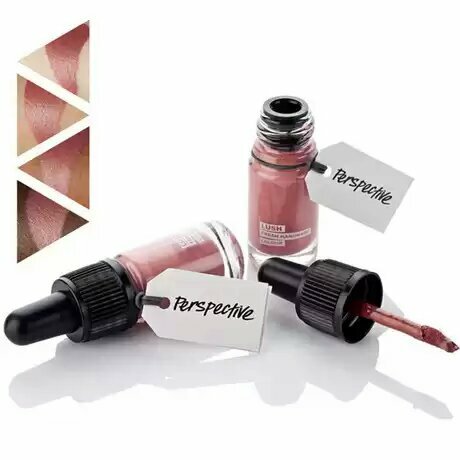 I would certainly buy more of Lush’s cosmetics, indeed I have my eye on Perspective, a natural dusky rose colour, for days when I want to be subtle or to emphasize my eyes. Due to the threat of fresher’s flu (which never developed beyond a nasty cough – touch wood) and extreme exhaustion (I have been in bed by 9.30pm every night for four weeks!) I haven’t accomplished very much. I desperately need to find some energy from somewhere before all my on the go projects start growing mould, plus I can’t carry on for much longer in this state. 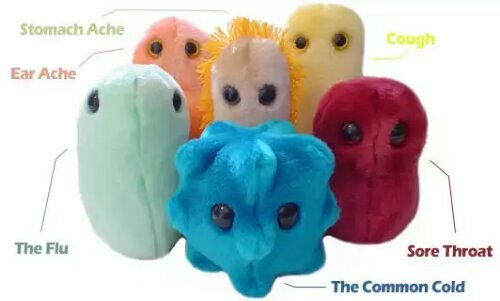 I did have some good news about my health this week, which means no more visits to the doctor until February’s medication review (Bacterial infections please take note and take your friends The Viruses on a well deserved holiday to the Antarctic). That has cheered me up a bit. Since the end of March I have been to the doctor’s every 2-3 weeks. They must have been as sick of me as I was of them! So here’s hoping October is a beautiful Autumn month with nice calmness and lack of these…..